Trading is performed using pending orders on important price levels, that are detected by advanced adaptive algorithm A.P.L.D., that gives the opportunity to respond quickly to changes of market conditions. The A.P.L.D. algorithm provides 3 strategies of important price levels detection. They can be used either together or separately. Two- levels adaptive TrailingStop for accounts with floating spread. Risk - parameter for automatic lot calculation, if AutoLot value is true. AutoRiskReduction - can be set to true or false. If true, it provides reduction of possible risks in case of simultaneous using of all three strategies. DD - the maximum allowable drawdown. If reached all positions of this currency pair will be closed. Strategy1 - can be set to true or false. If true, the EA used first strategy. Strategy2 - can be set to true or false. If true, the EA uses second strategy. Strategy3 - can be set to true or false. If true, the EA uses third strategy. TwoLevelTrailing - can be set to true or false. If true, the EA will use 2 levels of TrailingStop. The first - for order protection, the second - for earnings. EAMagic - magic number of the EA, which allows it to distinguish its orders. There are two more hidden EAMagic parameters that are determined automatically. That is, for example, if you set EAMagic = 10, then the advisor reserves two more “magic numbers” - 11 and 12. Keep this in mind when simultaneously running several robots on one account. Recommended settings for EURUSD are in video-guide or in description of signal. Different options of settings can be found in video-guide. I have been running Pender EA since beginning of February, so now for about 6 weeks. 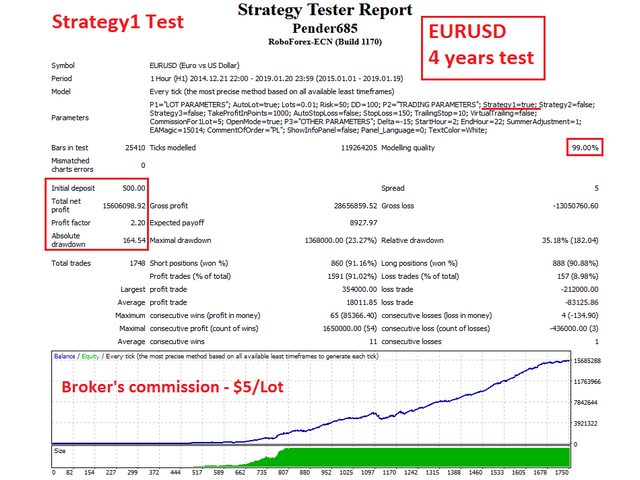 While I have had some modest wins, I have a loss of 12% or 600 euro in my case, over this period. 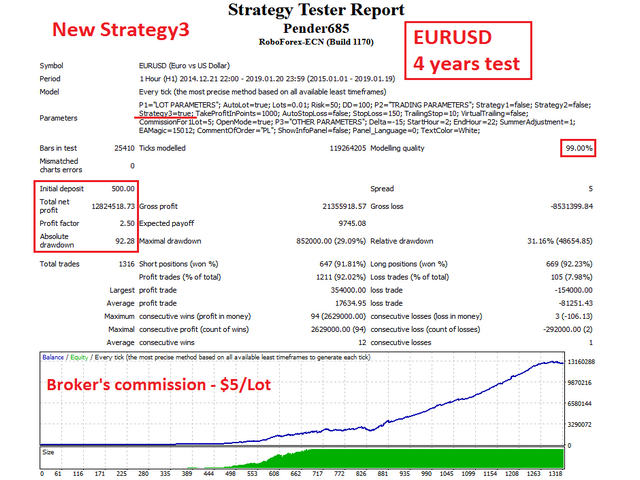 I am running with 3 the three strategies in parallel, for both EURUSD and since recently also GBPUSD. Somehow it seems the individual losses are a a lot bigger than any of the wins I make. BUT.. I am going to continue to use it for a while, hoping to make good on the losses I have made and I would like to believe this EA does have good potential. 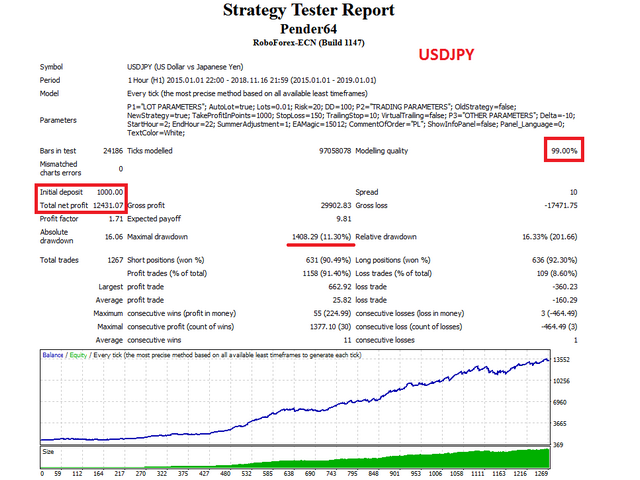 From all EA's that Evgeniy offers, this is the best that is offering consistent performance over few months, which can be clearly seen from the live trading signals. Practically speaking, I have seen profits in my account, however, it's too early to fully give out the values as it's been only two weeks with very less initial deposit. I will report in one or two months with exact values and the broker I am using. And I will tell you the best part, Evgeniy has personally connected via team viewer to my computer, VPS, to do the setup for me. Being an absolute beginner, that was greatly useful to me. Lastly, he has even helped me in setting up of VPS which I wasn't knowing at that point of time. My interactions with Evgeniy are extremely positive. This is a Good EA, but I don't know why need set different EAMagic parameters for every chart? That mean if i have 3 chart, so i need set 3 different EAMagic parameters to them? Tested it multiple times. Bought it today and will test live. I will keep you updated. Update: After 4 months i stopped this EA today, is seems that the EA makes significant higher individual loss trades then profit trades. 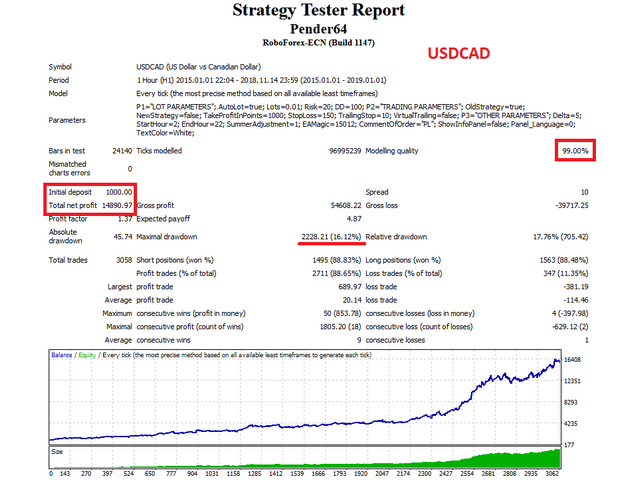 As you can see from the live trading account the results are very different then the results from the strategy tester. I started out very well but i dont know what changed but this EA is not profitable. I have to say the support was very good but iam not buying this product for the support. 1. The possibility of using all strategies simultaneously on one chart has been completely redeveloped. In previous versions, when setting the parameters Strategy1 = true, Strategy2 = true and Strategy3 = true, one pending order was opened in one direction, depending on the "nearness" to the current price. Now, when setting the parameters Strategy1 = true, Strategy2 = true and Strategy3 = true, the corresponding number of pending orders will be opened in one direction. That is, it is now possible to fully use the capabilities of the Expert Advisor on one chart. 2. The EAMagic parameter is left alone, but there are two more hidden EAMagic parameters that are determined automatically. That is, for example, if you set EAMagic = 10, then the advisor reserves two more “magic numbers” - 11 and 12. Keep this in mind when simultaneously running several robots on one account. 1. Parameter AutoRiskReduction was added. When set to "true", it helps to reduce possible risks in case of simultaneous using of all three strategies on different charts - setup Option2 in video-guide. 2. Automatic lot-size calculation for deposits, nominated not in US dollars, was corrected. 3. Automatic lot-size calculation for deposits with small account leverage was corrected. 1. Strategy3 was fully re-developed. 2. New video with setup options was published. Delay for order sending, when market has big volatility, was decreased. Small changes in virtual TrailingStop. 1. Adaptivity of TrailingStop to floating spread was added. 3. Unnecessary parameters were removed. Pending order management was changed in hedging strategy. Code and default parameters were optimized. Added the "Delta" parameter - indent from important price level for pending orders. Code of TrailingStop was optimized. 1. Small fix of TrailingStop. 2. Added the "TurboMode" parameter , which increases the number of orders. 1. Added the time zone auto detection. Some conditions for order opening were changed - Pender will trade more frequently. New strategy and new parameters were added.